Welcome to the Healthy Cat Search Engine page. 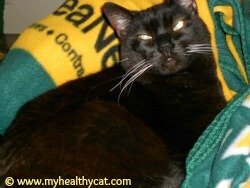 Use the Google Search Box below to find what you're looking for on MyHealthyCat.com. Type in what you want to find (e.g., "common cat health problems") then hit the "search" button. This page will then be replaced with a "results" page. You can also use the Sitemap listed in the navigation bar on the left to see a list and short description of the pages on this site. Neko Navigating an A's Blanket! Or you can click on any of the cat health and related topics on the left to find even more pages. Each topic page links to several other pages to help you answer questions about your feline friends. If you don't find an answer you're looking for, you can drop me a note using the "Contact" link on the left and I'll try to answer your question. But please note that I am not a veterinarian and I cannot answer questions about your cat's health. If you suspect your kitty is sick, please contact your trusted veterinarian immediately. 11 Veterinarians are Online Now.